That’s right, I figured in the spirit of trying to write more I would start posting my reviews and thoughts on the different stories I am currently perusing through. Not sure if you know this, but I like stories. Not just books, no, I like stories, no matter how they are told. I like a good story even if it’s a musical, or a play, or a video game, or a TV show, or a book, or a screenplay, or an anime, or a comic, or WHATEVER. If it is a good story told well, then I’m hooked. So as I start to write reviews for all the good stories I’m running through, I just want you to know that they are not at all limited to just books. Far from it, Jen! I’ll definitely post the reviews for books I’m reading, but I also just finished an impressive anime that I’ll be reviewing, as well as a popular TV show in the states, a good sci-fi movie and perhaps some video games. Basically, more of a snap-shot into what I’m enjoying at the moment and what’s influencing my writing. I’ll still post updates about my books, my writings, the novel I’m writing now (which is getting so good! ), etc. 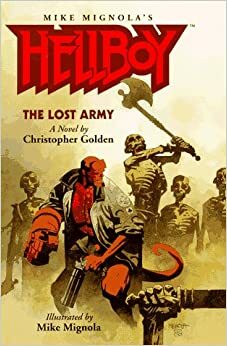 But now, without further adieu, I give you the first installment of my review category, Hellboy: The Lost Army. First and foremost, this isn’t a graphic novel, or comic book for you old-timers out there. This is indeed a full length novel, written by a NY times best selling author, Christopher Golden. There are a few illustrations done my Mike Mignola that are strewn throughout the book, but very sparse and all black and white. The book was published in 1997 (I know, right? ), but it takes place in the eighties and constantly references Ronald Reagan and payphones. Writing: The writing started off choppy and hard to get used to. Chris uses two word sentences a lot and speaks in short bursts of information that don’t flow that well when describing scenery or characters. But it turns out that’s just because he’s really really good at writing fighting and action scenes. 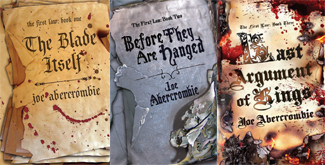 His style of writing is perfect for detailing fist-fights, gun battles and awesome magical duels. So once the slow beginning was through and the story started picking up, so did the writing. Imagery: Chris does a great job of really nailing down a setting’s description. He has the right vocabulary to paint the right mental picture and uses the short sentences to throw imagery at the reader quickly and concisely. The illustrations don’t hurt either. Characters: This will always be a big one for me, because besides the plot of the story, the characters are really what keeps me turning the pages and sticking around to find out what happens next. Hellboy, obviously, is the main character of the story, but has a female counterpart who compliments the story nicely. Hellboy is written as this empathetic character throughout the whole story, but by the end he’s basically just a walking pun generator, only speaking in lame jokes. I could have gone without that. Sidenote: So, if any of you have seen the Hellboy movies, you know that there is romance between Liz (the chick who controls fire) and Hellboy (the big red one). Well apparently, that wasn’t a thing until the early 2000s. This novel is the first time Hellboy actually has a romantic life, and it’s with this British archaeologist in the story. Liz is actually in this novel briefly, but only as a friend to Hellboy, a work partner. I just thought that was an interesting bit of information. The original characters from the graphic novels are present, Abe, Liz, Prof. Bruttenholm, but very minor. The female protagonist, again though starting off a little weird, really grew on me. She was strong, competent, funny, and British. What else do you need? Plot: The plot was pretty sound on this one. I questioned some of the twists and advances in the plot at the beginning, thinking to myself, “Why would they do that, if they could just do this instead? It would be easier…”. But that only happened a few times in the beginning when the mystery and story was still being set up. There were a handful of times that I could see conflict being forced. Big time. But by the end, there was so much action it’s hard to remember the slow parts. Verdict: All in all, this was a good read. Higher than your standard 3 stars, but not 5 star worthy. The story definitely had me hooked throughout and had very few slow points. There were many angles and plots going on simultaneously, and the different point of view characters were well written. My verdict: Thumb up. If you like action/adventure stories you should read this book. If you like humor and subtle romance, you should check out this book. If you get turned off by action, magic, supernatural stuff, or people overcoming dangerous odds, then stay away.